What a GREAT start to the year it has been here in Quepolandia with some truly world class fishing taking place during January & February. Plenty of Sailfish & Blue Marlin were caught with some good numbers of Striped Marlin and several huge Black Marlin in the 500lb plus range. Quepos boats have been seeing Dorado on most Offshore trips with some good sized Bull Dorado still being caught which are always a welcome addition to any charter. What a blast we all had at the Pelagic Rockstar Tournament held in January! The Marina Pez Vela was one big party for the weekend as a staggering 50 boats joined the action releasing a staggering 413 Sailfish & 11 Marlin between us! There were lots of Tuna and Dorado weighed also for good measure. Huge congrats to BIG OH for winning the big boat division with 26 Sailfish and Amy’s Dream for winning the small boat division with 9 Sailfish, great work guys! TAG TEAM won the Dorado division & The SEA HAWK PAINTS team won the Tuna division fishing on the stunning 50’ Maverick OPEN FLY. Congrats to all & I am already looking forward to next year’s event! We have enjoyed some great Tuna fishing recently with lots of fish in the 30-80lb class with some larger fish & several 200lb plus fish reported. Most of the larger fish are caught on live baits such as Bonitos, Blue Runners, Goggle eyes & Sardines. 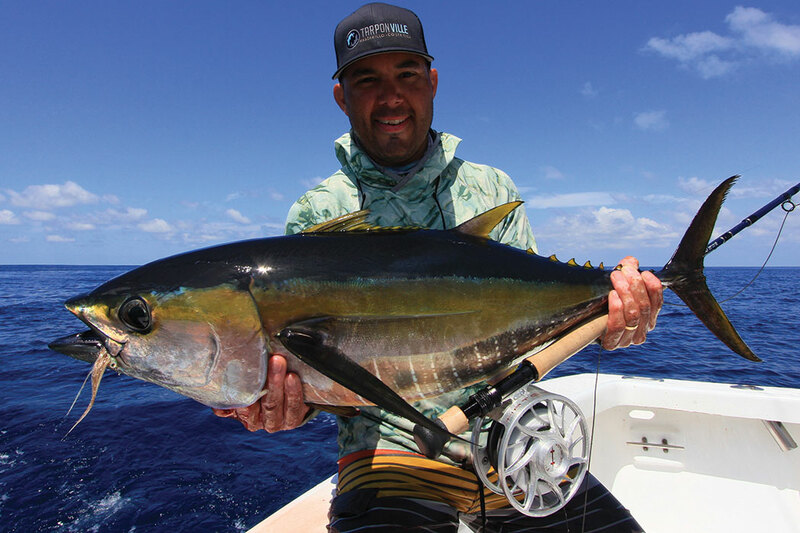 Surface poppers, artificial jigs and small tuna lures can also work great and account for many of the 30-80lb Tuna. Our Tuna form huge schools typically 20-50 miles Offshore and travel alongside Spinner Dolphin megapods which consist of several hundred dolphins, which provide some simply incredible scenes. 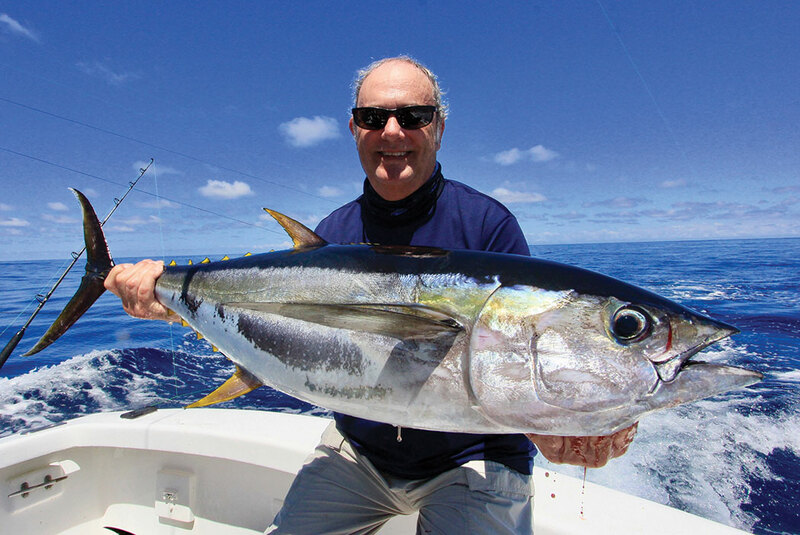 Reason enough to take a fishing charter in itself and March should continue to provide some excellent opportunities for Tuna. 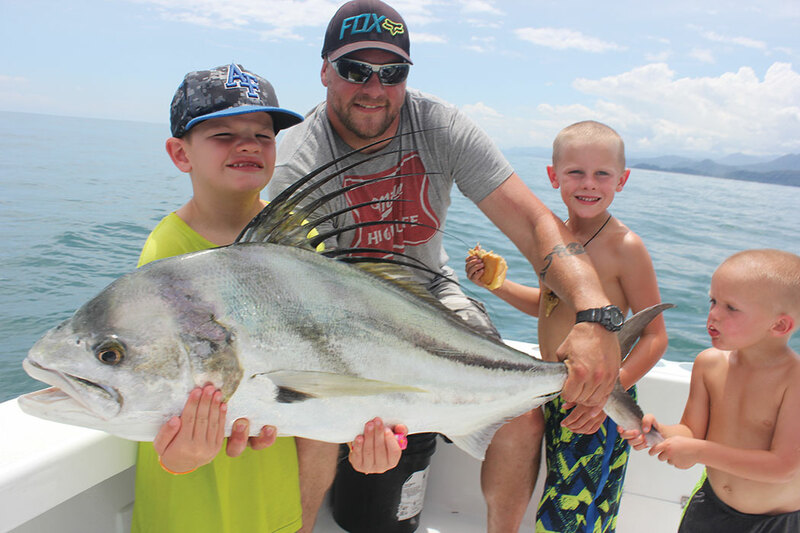 Welcome to the February installment of That’s Fishin’ and what incredible fishing we have experienced here in Quepos the past few months folks! With blue skies, hardly any rain for the past two months, calm seas and a great bite, what is not to love! The fishing both Offshore and Inshore has been fantastic during much of November, December and January with visitors travelling from literally all over the world to see what all the fuss is about! 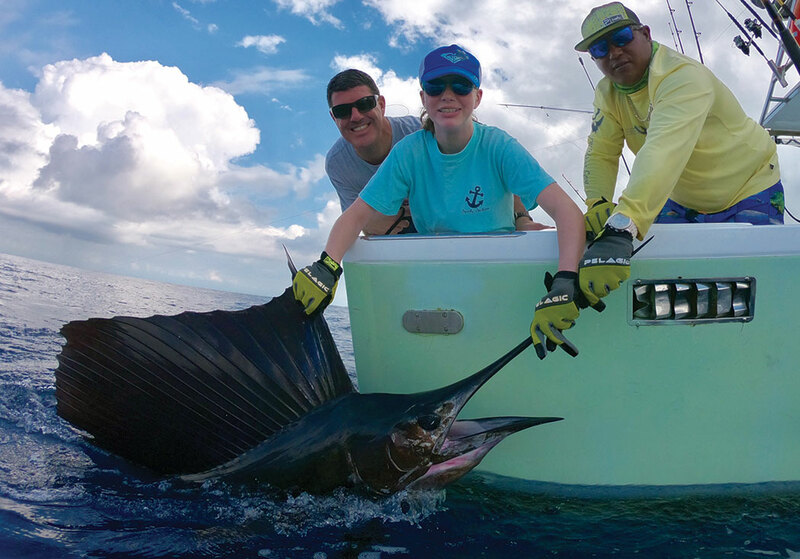 The Offshore fishing headlines during January are all about the Sailfish and some consistent bites have developed 20-35 miles Offshore in areas such as Furuno, The Pocket, & The Corner in recent weeks producing good numbers of Sailfish. Many boats in the Quepos fleet got into the double-digit Sailfish release days in January that Costa Rica has become famous for and these opportunities should continue through February. After an insane Blue Marlin bite in November and December, good numbers of Blues continued to be caught in January with a few Striped Marlin & Black Marlin mixed in also. A big shout out to the guys on Double Nickle who kicked off 2019 in style with a Grand Slam on January 4th! They had one of the best fishing days of their lives catching several Sailfish, a 350lb Black Marlin, a 500lb Blue Marlin plus a few Dorado for good measure! That is one incredible day of fishing wherever you are in the world! There were some HUGE Tuna caught during December and January also. One lucky Angler aboard GOOD DAY had the fight of his life when he battled a Tuna estimated between 160-200lb for 4 HOURS single handed! That is one determined young man and a very big fish to catch on 30lb class tackle, congrats! January continued to produce plenty of Dorado Offshore and it was great to see plenty of Big 30lb plus Bull Dorados keeping Anglers busy. February should produce more of the same, a solid Sailfish bite, Blue and Striped Marlin out deep and a chance at Black Marlin over the Offshore Reefs. Water temps will be hot which may thin Dorado numbers out a little but there should still be a few Dorado around plus Yellow fin Tuna together with the Spinner Dolphin mega pods. A huge happy new year to you all, may all your fishing dreams come true in 2019! After some epic fishing during December, Quepos captains are hopeful for an even better January which is typically the start of our peak Sailfish season. Large numbers of big Pacific Sailfish averaging 70-80lbs gather just a short run from our coastline and Anglers flock from all around the world to experience our incredible fishing for themselves. Double digit Sailfish release days are not uncommon during full day Offshore charters out of Quepos when the bite is on. Blue, Black and Striped Marlin are all possible during January also and Anglers can expect some Dorado and Yellow Fin Tuna to be in the mix also. We enjoyed some spectacular Dorado fishing during November and December, numbers will likely reduce during January as water temperatures rise during the dry season but you should still expect to see a Dorado or two on most Offshore trips. Yellow Fin Tuna will be found with the Spinner Dolphin schools, we get lots of Tuna in the 30-40lb range with plenty over 80lbs and some real 100-200lb plus monsters also. There was a 245lb Tuna caught out of Zancudo lodge in southern Costa Rica during December, an amazing fish demonstrating the potential we have here. 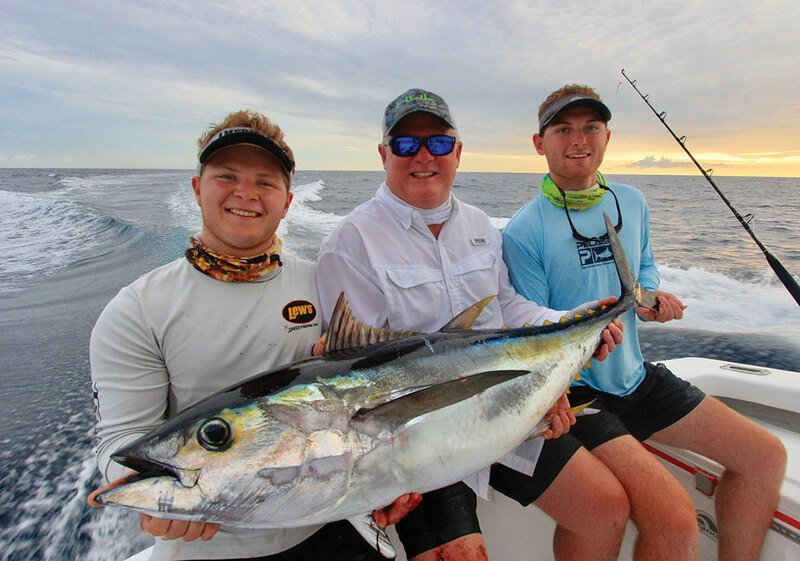 Welcome to our Dorado special edition of That’s Fishin! Dorado, Mahi Mahi, Dolphin Fish, three names but yes guys, it really is just one type of fish! No matter what you choose to call it, this magical fish has been capturing the attention of Sports Fishing enthusiasts around the world for a long long time. 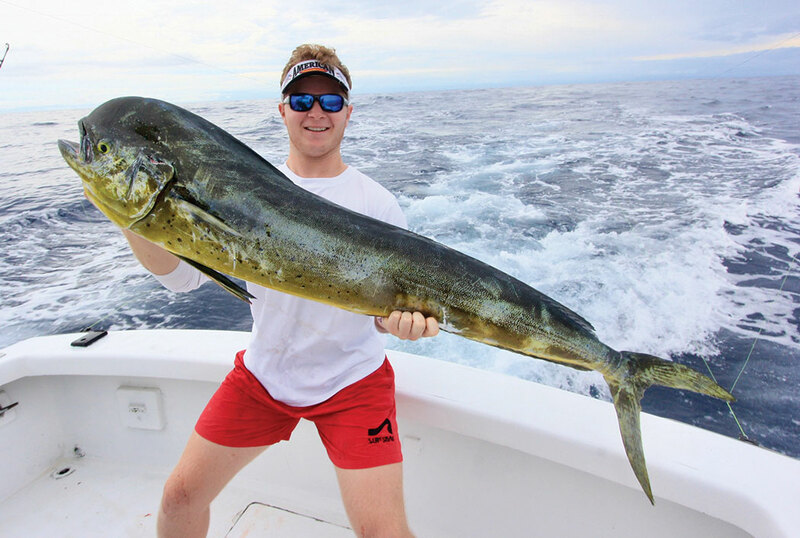 In fact, Costa Rica is home to the International Game Fishing Association (IGFA) World Record Dorado, a huge fish measuring 69.5 inches and tipping the scales to 87lbs! The fish was caught in the Papagayo area of Guanacaste in northern Costa Rica back in September 1976! So we are no strangers to large Dorado here in Costa Rica and in fact in recent months there have been some pretty special Dorado landed by the Quepos fleet. In July 2018 a 70lb Dorado was caught aboard the 31’ GOOD DAY by Charlie Rogers from ‘Against the Grain Charters’ (check them out!) in Key Largo Florida, whilst vacationing in Costa Rica. This was the largest Dorado caught aboard GOOD DAY for some years. Just 2 weeks later on August 8th, Jordan Gilchrist from Texas caught another HUGE Bull (male) Dorado measuring 65 inches which also tipped the scales to 70lbs! Jordan had also caught a 50lb Cow (female) Dorado the day earlier! These are just huge fish by Dorado standards. Many of the Quepos captains have caught 50lb plus Dorado in recent weeks which is just fantastic fishing. 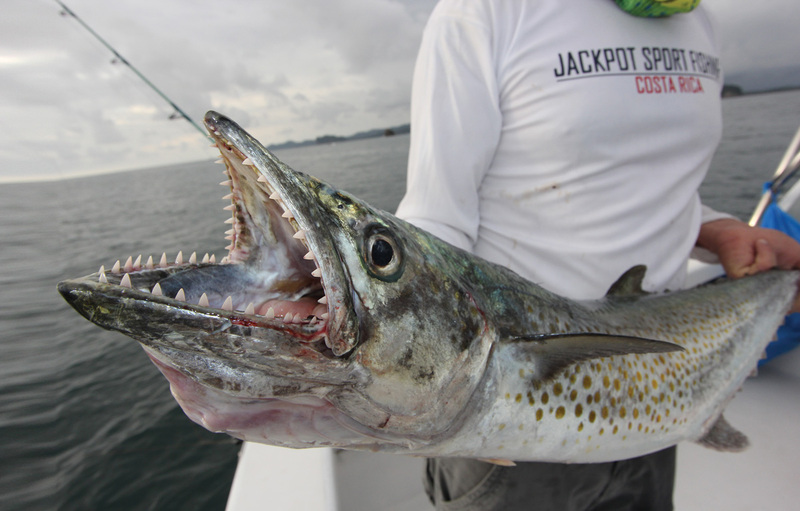 A warm welcome to the stunning Pacific Coast of Costa Rica & the August edition of That’s Fishing! We have plenty going on down here in Quepos & Manuel Antonio, the Offshore fishing has been great in recent weeks, there have been some HUGE Roosterfish & Snook caught inshore and at the time of writing, the Humpback Whales had just arrived in southern Costa Rica which are sure to provide some incredible scenes as they do each year, to those lucky enough to spend some time on the water. June & July produced some great Offshore fishing and there was some great species variety caught by the Quepos fleet. Blue & Black Marlin, Sailfish, Tuna, Dorado, Wahoo, Snapper & Grouper made up most of the Offshore catches. There were periods of some great Sailfish action and during one Offshore day trip in June the 31’ GOOD DAY released 13 Sailfish with reports of 20+ Sailfish days by other boats during the month, simply incredible fishing for this time of year! August will continue to hold some good opportunities for Sailfish and Blue Marlin for those Anglers looking to check a Billfish off their bucket list. There are still plenty of Dorado being caught during Offshore trips which are providing some great action and some nice eating for visiting Anglers. Simply take your catch along to any of the great restaurants in the area and they will be pleased to cook it up for you. BRAZILIANS STORM THE OFFSHORE WORLD CHAMPIONSHIPS! The Marina Pez Vela was once again the proud hosts of the Offshore World Championships which took place at the end of April. 51 teams from 30 countries descended on Quepos/Manuel Antonio for the Olympics of Sport Fishing and it was a truly special week here in paradise. 328 Sailfish & 24 Marlin were caught and released during the 4 fishing days as well as 18 Dorado, 3 Wahoo and 3 Tuna making it to the scales. The top 4 teams were all from Brazil with eventual winners, representing Rio de Janeiro. A huge congrats to all entrants but especially the Brazilians, who showed everyone how to fish this year, congrats guys! The Quepos Billfish Cup team who were representing not just Quepos but the whole of Costa Rica, really did us proud and finished in a very respectful 6th position, well done Sam, Nicky, Justin, Parker & Josh! The top boat of the week was EPIC Captained by Michael Alligood. Huge congrats for a fantastic performance taking top honours for the second time in recent years! All tournament records were broken for the quality of the Dorado weighed with the top six fish all being over 45lbs and the largest Dorado weighing an impressive 62lbs! The scene is set for our 1st ever Dorado Derby coming up this November (details below)! You are visiting Costa Rica at an excellent time with less people and the start of our afternoon rains to cool the air and give the jungles the water they need to spring back to life after the dry season. 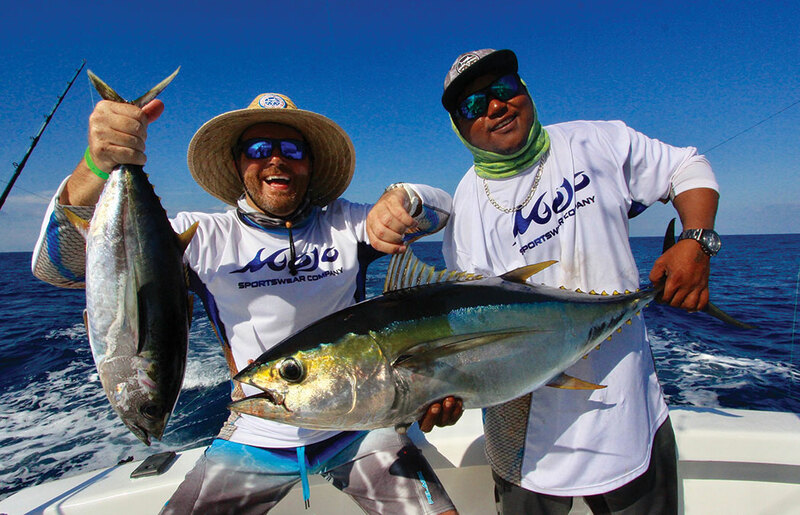 With the rains, our Ocean temperatures now begin to cool which makes way for some of the best Tuna fishing of the year. Big Yellow Fin Tuna with a few Big Eye Tuna mixed in can be targeted 20+ miles off the coast during a full day Offshore trip. Smaller fish in the 20-50lb range can be caught using artificial lures such as Bucktail Jigs, Tuna Bullets and even dark coloured Bass worms fished on a Jig head have been working great this season! 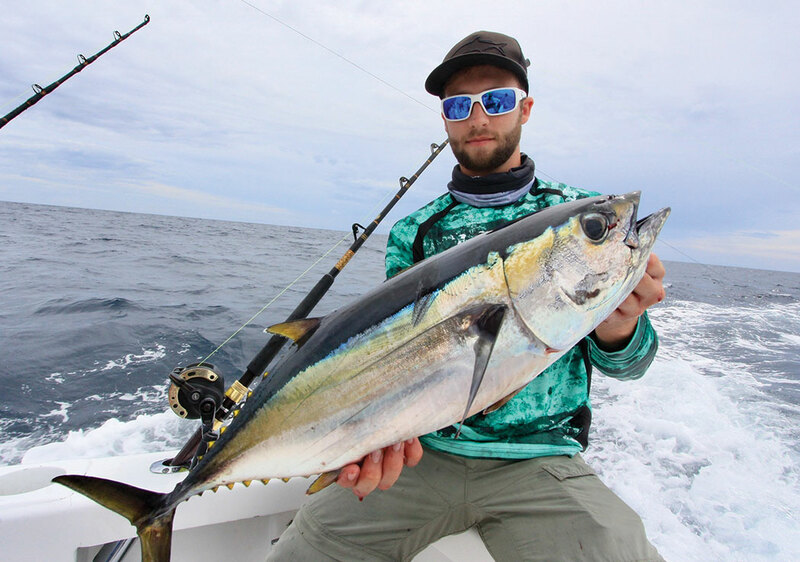 For the bigger Tuna Livebait is always the first choice and a Live Bonito takes some beating but Blue Runner, Goggle Eyes and Sardines can all work well too. Good livebait and the right Tuna school will put you in with a chance of catching an 80lb plus fish and there are many larger fish out there too with many 100lb plus fish landed this year and even some 200lb plus monsters. Wicked Tuna stuff for sure! We might not get the Sailfish numbers in May & June that we do December through April, however, we see Sailfish on most Offshore trips, there will be a few Dorado out there and it is an excellent time to fish for Marlin. Welcome to the April edition of That’s Fishin and a big hello to all our visitors from around the world! Thank you for visiting Costa Rica and we hope that your visit totally exceeds your expectations. It has been an excellent high season so far with lots of visitors excited to get out on the water and experience our world class fishery for themselves. There has been a high demand for Sport Fishing this year and if you plan to go fishing you should book your boat as early as possible to secure the best boats. The fishing has not disappointed either and the story for me this season has been our excellent species variety. Offshore we have had good numbers of Sailfish with many charter boats releasing 2-5 Sailfish a day and some Anglers have been lucky enough to experience double digit Sailfish release days. There have been Blue, Black & Striped Marlin out there also, the Blues & Stripeys in the deeper water and the Black Marlin over our Offshore reefs. We expect a good Sailfish bite to keep us busy during April and put that with an excellent run of Tuna & Dorado (Mahi-Mahi), which are a welcome addition to any trip this, many boats have returned to the dock having caught Sailfish, Marlin, Tuna, & Dorado in the same day which is an awesome day’s fishing wherever you are in the world! There is the odd surprise species out there too—several nice Wahoo have been reeled in recently during Offshore trips out of the Marina Pez Vela! We have had a blistering start to the Sportfishing year here in Quepos with some magical fishing experienced during January & February. At the start of the year, water temperatures remained cool due to the la niña weather cycle which made for some great fishing with fantastic species variety. There have been lots of Blue Marlin this year with boats getting multiple shots on Marlin during Offshore trips on many occasions. The Dorado bite continued with most boats in the fleet have been seeing a few Dorado each trip which makes for a fantastic addition when targeting the main event, Billfish. The Tuna bite has been strong with many 100lb plus Yellow Fin’s landed and a few supersized fish also, the kind of fish you spend your whole life wishing you could hook and once it has been on the line for 30 minutes, you kind of wished you had not hooked…but that’s fishin’ my friends! In recent weeks water temperatures have risen dramatically and we expect the Dorado and Tuna bite to start to thin and the Sailfish numbers to peak during March. We have experienced some banner Sailfish days with boats raising more than 20 Sailfish but the bite has been a little up and down, great one day and a little slow the next but that keeps us on our toes and always searching for the best action. 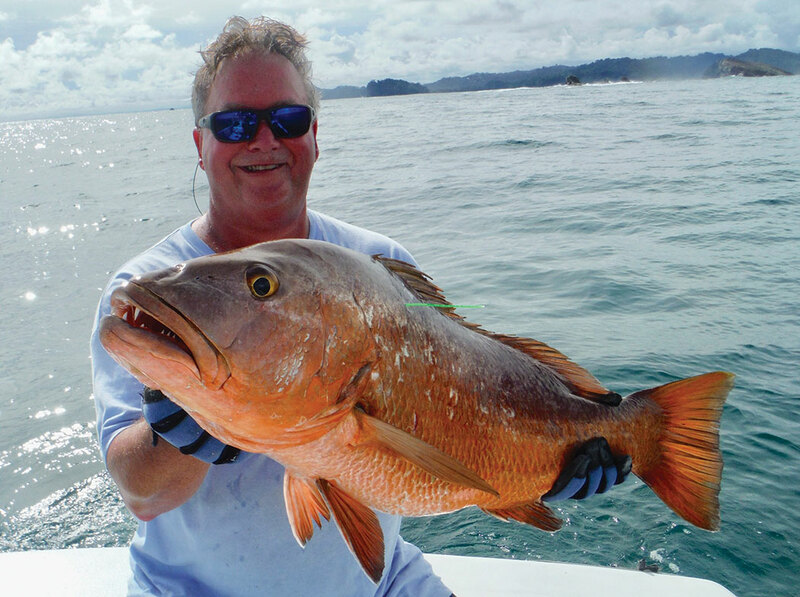 February can only be described as a HOT HOT HOT time for Offshore fishing here in Quepos. It is perhaps the Number 1 month in the calendar for Sailfish and is why thousands of Anglers from around the world descend on Quepos to hook up with one of our great captains and experience our amazing fishery. If you have always dreamt of catching a Billfish then you have come to the right place and you could not have timed it better than coming here in February. 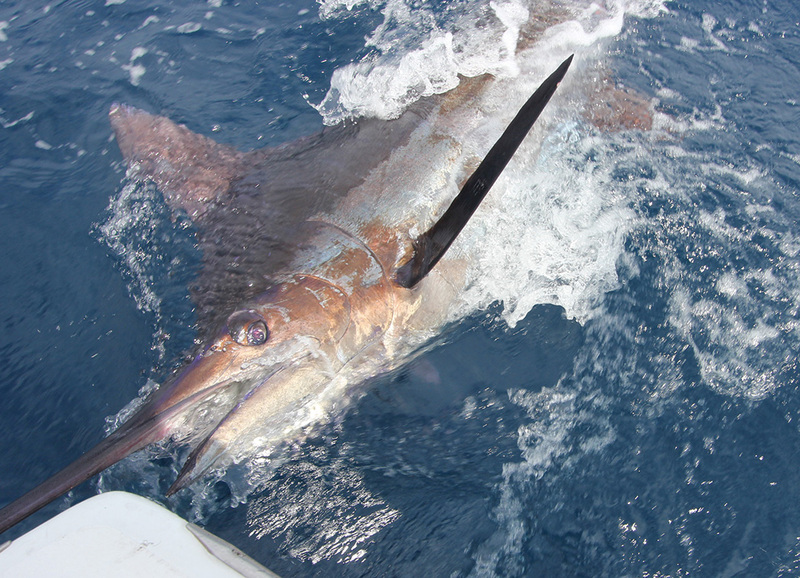 Big Pacific Sailfish in the 70-140lb range will be available 20+ miles off our coastline. Blue, Black and Striped Marlin will be in the mix also, as well as Yellow Fin Tuna and Dorado. If you want to target the big Pelagic’s such as Sailfish & Marlin, a full day (8-9 hour) Offshore trip is the best option to give you adequate time on the water and increase your chances of landing a dream catch. Check out some of the photos of our happy Anglers from the past month or so releasing their trophy Marlin & Sailfish catches. They will not be forgetting their experience in a hurry! January kicks off the peak time in our Billfish season, where our waters off Quepos offer Anglers some of the best Sailfishing on the planet when huge numbers of big Pacific Sailfish (70-140lbs) gather here to reproduce. Anglers flock from all corners of the earth to come and experience our amazing fishery for themselves. There are not many other places in the world where you could be in with a chance of double-digit Sailfish releases in just one day. This is what Quepos is famous for—you have come to the right place! THE PELAGIC ROCKSTAR—THE WAIT IS OVER! With the arrival of our Billfish, it is by no coincidence that the first of our major tournaments, The ‘Pelagic Rockstar’ takes place this month from January 11-13. 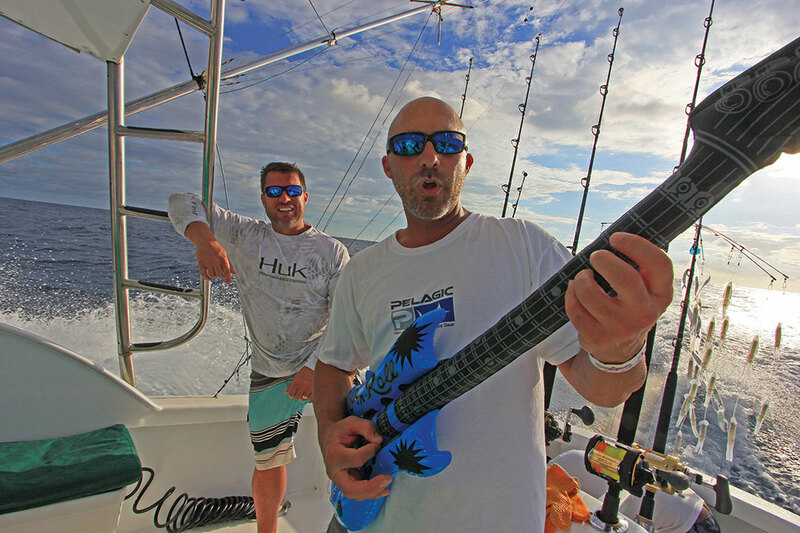 The event promises to throw the entire Marina Pez Vela into party mode for the weekend with Rock ‘n Roll Bands, Pelagic Girls, dockside parties, & your chance to purchase some awesome Pelagic fishing apparel at the tournament village. For the competing teams there are some big cash prizes (and bragging rights!) to aim for but even if you will not be fishing, come down to the Marina Pez Vela and join all the fun. There will be early morning boat parades before the teams head offshore and from sunset onwards you can join us for the nightly bands & entertainment. This event promises to be a blast! Last minute entries to the tournament can be made by contacting the iFish Quepos team at tournaments@marinapezvela.com. January 11 Team registration & 7pm kick-off party. January 12 6.30am boat parade, day 1 fishing & 4.30pm dockside social. January 13 6.30am boat parade, day 2 fishing & 7pm evening prize presentation. Our November Fishing here in Quepos was a blast with lots of big Dorado (Mahi Mahi) keeping Anglers busy during their Offshore trips. The bite has been super close to Quepos with great Dorado fishing only 10 or so miles from the Marina. Dorado will continue to be caught in December, however, boats will be pushing out further and deeper as most visiting Anglers will be here with one thing on their mind, Billfish! December is one of the top months of the year to catch Marlin and our Sailfish bite will be heating up as the month progresses before it peaks between January & March. 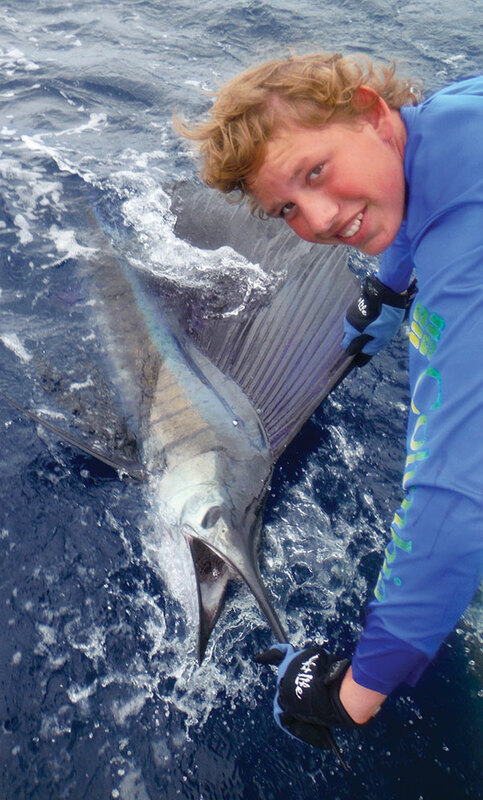 With good numbers of Sailfish about and the opportunity of catching Blue, Black & Striped Marlin, December holds great potential for Anglers that would love to try and catch a grand slam of three different Billfish species in a day. No easy feat anywhere in the world, however, Quepos holds that potential. There will be some great Yellow Fin Tuna fishing Offshore whilst our Inshore fleet will be focusing on Roosterfish, Snook, Snapper, Jacks & Mackerel whilst fishing the rocks, islands and river mouths close to Quepos. With the water temperature warming as we enter the summer, we will see more bait inshore around Quepos than we have for six months bringing the predatory fish hot on their heels. November is one of the favourite months for fisherman here in Quepos. A month or two in the boat yard getting our boats ready to go again for high season is long enough for any Captain and we cannot wait to go fishing again come November 1st! The rains disperse as the month progresses to make way for the clear blue skies and flat calm seas that the Central Pacific coast is famous for. November is a transitional month, where water temperatures start to rise, baitfish numbers increase and lots of predatory fish hot on their heels. We typically don’t see the crazy Sailfish bite that we do during January-April but there should be good numbers of Sailfish around and couple this with the excellent variety of species we have in November, Anglers should be in for some awesome fishing. Right now is the peak time to catch Blue Marlin on day charters from Quepos and there were some epic Marlin days recorded this time last year. You can expect some big Yellow Fin Tuna schools 30+ miles Offshore as well as pretty much the TOP month of the year for Dorado! We have had some great Dorado fishing during September & October along the current lines off Quepos and this action should peak this month when good sized fish should be here in numbers. Often some of the best Dorado action can be found less than 10 miles from the Marina Pez Vela, an added bonus—less running time & more fishing! Inshore Fishing trips are a great option for families or those worried about spending a full day Offshore. Half day Inshore trips will give you 5 hours on the water, take you along the stunning coastline where you can target Roosterfish, Snook, Snapper, Mackerel, Jacks & more. With the bulk of the rains out of the way, water clarity will improve as the month progresses, large shoals of sardines will gather inshore with the big guys not be far behind!